the mask of "Kamagami sama" is protecting the brewery. known in northern part of Miyagi and some parts of Yamagata prefecture. Sanbongi is the town of wind. When I visited the brewery in late May, there was dandelion puff floating everywhere. it covered the ground of Sanbongi so quietly and so gently. Eating lunch with everyone at the brewery tasted the best. My stomatch was fuller than any other time, by sharing a dining table with so many people. People at brewery are the persons of calm mountains. they never exaggerate, but have protected the brewery with their armful love. but at the same time, he has constant and unextinguishing blue fire burning inside. by leading and comforting everyone to the brighter side. He is the person who has humble, yet kept the strongest will and spirit. he is a person like Hakurakusei sake. Every single one makes up this brewery. "Our Sake may not be found be found now, but will be found and fly in the sky." This name of Sake is filled with thoughts when Mr. Niizawa re-started the business. Yuriage, Natori-city in Miyago Prefecture. Yuriage, the town of 7,000 residents has been famous for finishing, especially Akagai Ark shell. and took a big roll as a food source for Date castle town around 15th century. more than 10% of the whole population in the town. which took away every single thing that existed and lived in this place. they were too enormous, and too cruel to interpret. 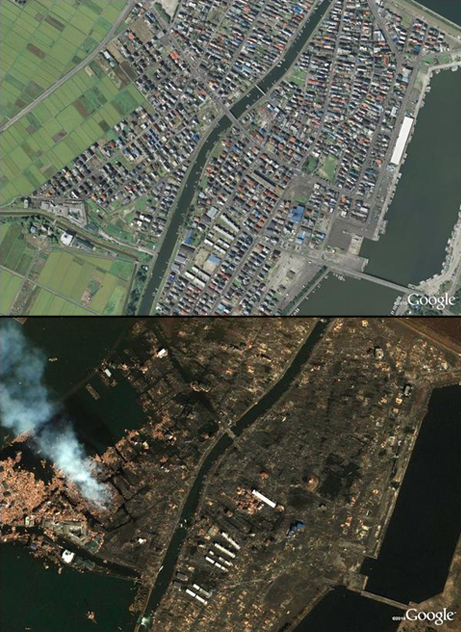 This is an image before and after the 311 earthquake. unlike other Kanji characters came from China. which stands for the water inside the gate. This town, is born, and grew with water. This is a hill where hundreds of lives rest. one old pine tree is looking down the town. "We never work to betray these people." that's all I think too. situated in Sanbongi, Oosaki-city, Miyagi prefecture. and became the youngest master sake brewer in history. and grew up as one of the most famos brand in Japan. severely damaged this 138 years old historical brewery. the collapsed building has considered to be no longer possible to continue its production. and they lost nearly the half of one year production. Under this circumstances, they re-started its production from this week. 15,000 magnum bottles of Sake until this summer. to their fans all over the world. they ship their love as well. in response to Mr. Niizawa and brewers' big decisions. the number of the support for new Niizawa Jozoten is so, so many. but never too many. I was honored for this opportunity to help their sake production and labeling bottles for 3 days. the biggest part of my trip back to Japan, is to visit this brewery.